Approximate Image Size: 19 1/2" x 24"
A Conservation Edition has been published for N.W.T.F. Also a Canvas Edition may be published. Our October release Black Powder Gobblers, has earned Jack the title of Featured Artist of the Year 2000 for the National Wild Turkey Federation. NWTF will promote a Conservation Edition of this print at their 2000 Banquets. We are currently accepting pre-orders. 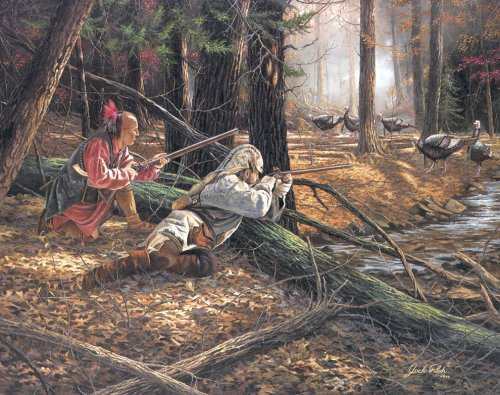 This piece joins the Frontiersmen and Native Hunters in a hunting alliance. Having chosen the perfect sight, the hunting partners use their wing bone calls to entice a group of wild gobblers into range. You may have seen this piece on the cover of NWTF Turkey Call, September 1999. The following are other artwork of Jack Paluh. Paluh Publishing, Jack Paluh Arts, Inc.
Framing available at additional cost.